LCROSS, the flight mission, is over, but we’re still analyzing the data that was collected on impact night. Our team is very excited about the recent announcement – that LCROSS confirmed the presence of water at the lunar south pole. But, there’s a lot more data to analyze, both for science and engineering purposes, and I’m guessing there will be more interesting announcements in the months ahead. With the completion of mission operations, before concluding my account of the LCROSS journey, I wanted to add a few more posts relating our team’s experiences in the last day of the mission. In this post, I’ll describe my last shift in the Mission Operations Control Room (MOCR), covering the Separation event and the final delivery of the Centaur impactor. In a near-future post (I promise! ), I’ve invited our Payload Engineer, Mark Shirley, to post with a detailed look at payload operations during the Impact event. For all of you who watched the impact video and are wondering what happened that evening, Mark’s post should be very enlightening. Now, a note about terminology – the two major pieces of hardware on LCROSS are the Centaur (the impactor) and the Shepherding Spacecraft (abbreviated as “S-S/C”), which carries the science instruments and that has acted as the “living” part of LCROSS since the Centaur’s batteries ran out on Day 1 of the mission. Up until now, I’ve referred to the combined Centaur and S-S/C as “LCROSS”. But in describing what happened after Separation, when the two pieces decoupled, I’m forced to refer to each vehicle independently. Finally, as a reference for timeline details, check out my post entitled “Brace for Impact: A Schedule of Events for the Final Day”. On October 8, I was the Flight Director in charge of the second-to-last shift (Shift A) of the LCROSS mission. Shift A’s main task was to perform final targeting of the Centaur, via the separation of the Centaur from the S-S/C. The Separation event was the final influence our team would have on the Centaur impact location and time. Soon after Separation, we were to command the S-S/C to image the Centaur as it receded from view. Shift A was also in charge of the “braking burn”, a delta-v maneuver performed after Separation that would decelerate the S-S/C relative to the Centaur to delay its own impact on the moon, thereby improving our view of the impact event during the collection of science data. Once “on console”, Shift A’s first responsibility was to load all of the command sequences to the S-S/C that would govern the initial attitude change to Separation attitude, the Separation itself, the Centaur Observation and the Braking Burn events. With so much at stake, the Flight Team was very focused, and we completed those command loads very early, with no problems. The onboard commands were designed to execute the whole sequence through Braking Burn (minus the Centaur Observation) without human intervention. Barring unforeseen problems, the Flight Team could have walked out of the control room at that point. But in reality, there’s no way we’d leave the success of the mission to chance. As I’ll describe later, Separation had a lot of potential risk. If anything went wrong, our team needed to be there to take corrective actions and to set up for Impact. Furthermore, the Flight Team had an integral role in initiating the Centaur Observation. To precisely target the Centaur into Cabeus crater, our plan was to use a fraction of the velocity change caused by Separation to push the Centaur into the right impact trajectory. The interface ring between the Centaur and S-S/C contains springs that push the two vehicles apart as soon as they’re released. They produce up to an estimated 500 lb of force, and were predicted to induce approximately 0.7 meters/sec of relative velocity between the two vehicles. However, since the Centaur far outweighed the S-S/C, we expected only 0.15 m/s would be imparted to the Centaur, the rest to the S-S/C. But we didn’t need all of that extra velocity for a precise impact. To use only a fraction of this added speed, we’d have to perform Separation in a specific direction, so that only the needed component of the velocity change would affect the impact position, while the other components would have no effect on impact position and little effect on timing. Our Maneuver Design team determined, coincidentally, that this direction was only 7 degrees away from our starting Cruise attitude. So, what happened? A portion of the commands we had just loaded automatically performed the change in orientation. We needed to take every precaution not to disturb our orbit prior to Separation. Rather than commanding the entire 7 degree change in one step, the command sequence performed the maneuver in a long series of small attitude updates. This minimized the number of thruster firings required, though it took over 20 minutes to complete. The whole sequence of commands executed perfectly and with one task completed, I prepared mentally for the next. With the rotation completed, we were less than one hour from Separation. Centaurs typically separate from their payloads within just hours of launch. LCROSS’s Separation was 112 days after launch, far longer than ever done with a Centaur before. The space thermal environment often wreaks havoc on mechanical elements, with extreme temperatures and many swings between hot and cold. Analysis showed that the mechanism could operate over a very wide range of temperatures and after many warming/cooling cycles. Still, we didn’t know if something had been overlooked. The good news was that temperatures from the separation mechanism had remained well within allowable limits for the entire mission, increasing our probability of success. 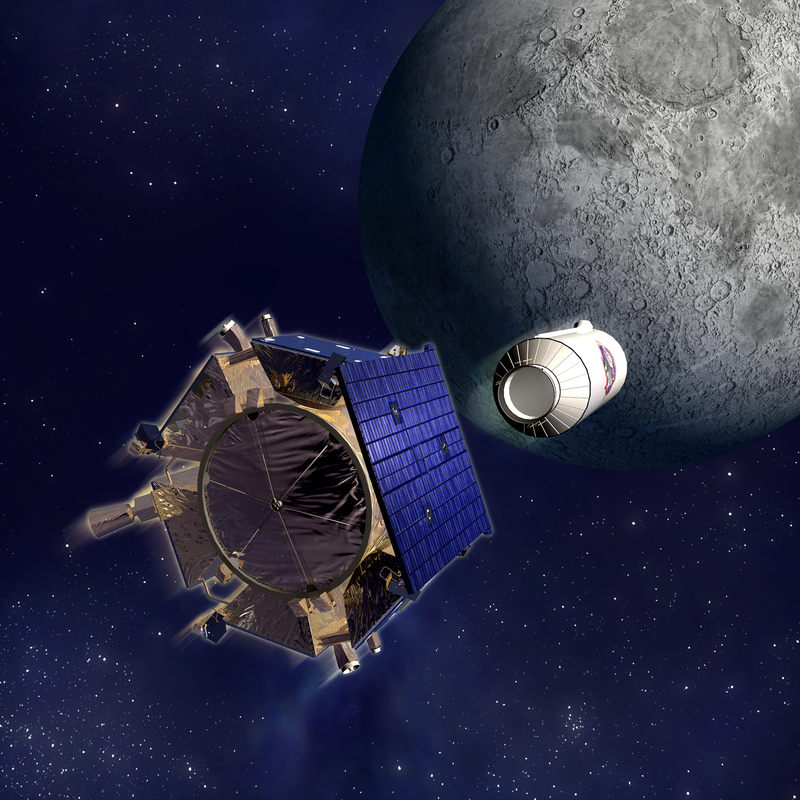 However, if Separation were to fail, LCROSS would impact in one piece, the science payload would be unable to watch impact, and our mission success would be entirely reliant on ground-based and other orbiting observatories to collect impact data. The Centaur separation mechanism was designed to very reliably push the S-S/C away smoothly, without causing the spacecraft to tumble. To prevent attitude control from interfering with Separation, the command sequence would disable ACS thruster firings briefly through the transition. But what if something snagged or re-contacted? Disabling the ACS would allow rotations induced by separation to go unnoticed (and uncorrected) for a few seconds. Again, analysis predicted success, but there were a lot of unknowns here. In the instant of Separation, LCROSS would transform from a 2894 kg spacecraft to a 617 kg spacecraft (about 1/5 of the mass). The moments of inertia (the spacecraft’s tendency to resist changes in rates of rotation) would also decrease dramatically. To remain in control after this enormous change, the ACS would use new sets of control gains optimized for post-separation conditions. But none of these controllers had been tested on the real spacecraft (only in good simulations – they wouldn’t have worked well with the Centaur attached). Dynamically, it would be like getting a whole new spacecraft, but with only 9 hours to figure out how it really behaved before Impact. To make matters more exciting, our command sequence utilized 5 out of 6 attitude control modes in the first 40 minutes after Separation. Each mode employed an independent set of control gains. One mode might work, and another might be flawed and cause an instability. Though the Centaur and S-S/C would recede from each other at very slow speed (0.7 m/s, or about 1.6 mph) after Separation, it wouldn’t take very long for the Centaur to be quite far from the spacecraft (42 meters or half of a football field farther each minute). The Science Team really wanted to film the departing Centaur to determine whether the separation had induced any tumble into the Centaur, and to use that knowledge to better understand the Impact behavior later. To “see” any tumble, which might be very slow, we would need to be able to distinguish the Centaur long axis from its short axes. To do that, the Centaur would have to be close enough to span at least a few pixels in the LCROSS cameras for several minutes. But at Separation, the LCROSS cameras would be facing away from the Centaur. The mission plan involved flipping the S-S/C 180 degrees to point them toward the Centaur as soon as possible after Separation. But this ran counter to the desire of our engineers, who would have preferred to watch the ACS control behavior for a while. As a compromise, we planned on rotating just one minute after Separation. Good for Science, but a little uncomfortable for the Flight Team, which would have to confirm a good separation, then oversee a 180 degree flip on a new set of control gains! Neither the S-S/C nor the Centaur could automatically confirm that separation had actually succeeded, so the Flight Team needed to confirm success from the ground via telemetry. A set of three small wires would break at Separation, and enable us to determine a physical separation. Then indirectly, we expected to observe a dynamic response from the S-S/C from the push and any resulting torques. When designing this event, we had a choice: either have the Flight Team initiate the 180 degree flip from the ground on successful Separation (but risk being late on the Centaur observation if we lost communications), or execute the flip using onboard commands and have the Flight Team terminate the sequence if Separation failed (but, if we lost communications and the ability to command, risk performing the flip with the Centaur still attached). Mission-wide, we had adopted a policy that assumed success, so we opted for executing these commands onboard. This meant that within 60 seconds, the Flight Team had to identify whether Separation had been successful, and terminate the running command sequence if it had failed. Sixty seconds may sound like plenty of time, but with multiple operators on console evaluating multiple telemetry indicators, allowing time for a possible termination of the command sequence, sixty seconds was barely enough. So, what actually happened? At 10 minutes until the designated Separation time, the onboard command sequence started to run. Game time. Months of design, weeks of training would all come together now. I counted down the last 5 seconds until the commands to fire the Clamp Band Ordnance Device (CBOD) would have issued from the onboard sequence. Then we focused on telemetry. Silence on the voice loop. Ten seconds after the separation time, the Flight Team broke into chatter over the voice loop. I polled the System Engineer. He returned with “three wires, Flight”, meaning that all three wires that indicate a clean break between Centaur and S-S/C all showed positive. I polled ACS (Attitude Control System Engineer). He announced “GO Flight”, indicating he had observed a significant attitude disturbance that could only have happened with a successful separation. I polled the Flight Controller, and he confirmed “three wires”. In the meantime, the control system had re-enabled, and quickly brought the attitude back under control. Separation was a “GO”! Relief. No need to terminate the nominal sequence. I instructed the Flight Controller to waive that option. Then, at the expected time, the S-S/C began to perform its 180 degree flip. With no time to celebrate, the Flight Team re-focused on the next task – Centaur Observation. Figure 2: Depiction of of Shepherd and Centaur, Post-Flip: The Centaur appears unrealistically close. At 4 minutes after separation, the Centaur would have been about 170 meters away. Also, unfortunately, with the change in separation attitude from the original plan, the moon did not appear in the background of the Centaur images. To ready for Centaur Observation, the Flight Team’s next job was to reconfigure the communications subsystem and payload to enable the spacecraft to collect imagery of the Centaur as it receded from view. To enable the downlink of high-rate imagery, we first had to switch from our nominal downlink data rate of 64 kilobits per second (kbps) to 256 kbps. Once the data rate had been increased, we’d then increase the allowable data output rate of the science payload, and switch from the low-rate to the high-rate imagery sequence designed for this event. Data rate changes and antenna changes were two operations that we typically didn’t perform via onboard commands. Each requires the DSN antenna providing the link to re-acquire the spacecraft signal. The time needed to do that varied significantly, but fixed-time commanding doesn’t allow for that flexibility. For this event, we had three Madrid DSN antennas watching simultaneously (two 34-meter dishes and a 70-meter dish), and each needed to re-acquire the LCROSS signal after the downlink rate change. To complicate things, we knew we couldn’t achieve an adequate link margin at 256 kbps until the spacecraft had completed its 180 degree flip (to point the center of the secondary omni-directional antenna pattern towards Earth), the duration of which wasn’t known with high certainty given our lack of in-flight testing with the new gains. By design, we planned to utilize ground-based commanding. In actual flight, as expected, the science payload powered-on just as the S-S/C began to flip. Payload Engineering reported good status. Soon, the cameras were transmitting low-rate imagery, but we hadn’t rotated far enough to see the Centaur yet. But without the Centaur on its aft end, LCROSS behaved less like a school bus and more like a sports car. It was making short work of the 180 degree flip. At three minutes, with the flip complete, we commanded the downlink rate change. At about the same time, Science reported the receiving the first image of the Centaur, under the low sampling rate. The DSN stations re-acquired the signal, and as soon as possible, we commanded the payload to begin the high-rate image sequence. We has successfully configured the S-S/C for the Centaur Observation, and we now had a little time to breathe, and to watch the Centaur images flowing into the control room. This link points to a movie made by the Science Team using the images collected during the Centaur Observation (with time sped up significantly). In the movie, you’ll notice it looks like the Centaur is moving all over the place, but really it’s the S-S/C rotating back and forth. The attitude control system keeps the spacecraft pointed to within a small “deadband”, a small imaginary box around a target pointing direction. The ACS only fires thrusters if the S-S/C is getting near the edge of the deadband. What you’re seeing is the ACS “bouncing” on the edge of the deadband. If you look carefully, you’ll notice that the ACS seems to change to a smaller deadband later in the movie. This not an illusion. The spacecraft switched from a wider deadband (1.0 deg) to a narrower deadband (0.5 deg) partway through the observation sequence, as part of a test of the new control gains. You’ll also observe that the Centaur is in a very slow tumble. At the time of the Centaur impact, to meet the observation requirements, the S-S/C needed to be roughly 600 km above the lunar surface. This was a trade-off between being too close (and possibly being hit by debris from the Impact), and being too far away (the spatial resolution of our imagery would decrease with distance from the surface). The velocity induced by Separation between the S-S/C and Centaur (0.7 m/s) would be too little to achieve that distance in only 9 hours 40 minutes, so the Braking Burn was inserted into the mission design to slow down the S-S/C down by an additional 9.0 m/s (about 13 times the velocity change of Separation). The Braking Burn was also designed to independently target the S-S/C impact point, also selected by the Science Team. In flight, nineteen minutes after Separation, the onboard sequence terminated the Centaur Observation and began configuring the spacecraft for the burn. The Flight Team quickly commanded the return to 64 kbps downlink rate (necessary before changing our attitude again), and the DSN re-acquired the signal. The onboard sequence performed another attitude change, this time to the optimal burn attitude. Ten minutes later, after passing through two more new attitude control modes, the burn started on time. Four minutes of firing the 22 N thrusters was predicted to be sufficient to slow ourselves down to meet the impact distance requirement. With the burn over, we had crossed Shift A’s last major hurdle. We had a few final things to do before our handoff to Shift B. We biased our attitude to keep our thrusters warm, re-enabled payload heaters, and loaded a preliminary Impact command sequence to the spacecraft. Planned before Separation using predictions of the post-Separation and Braking Burn orbit, those commands were designed to perform the full Impact sequence without the Flight Team. They were an insurance policy to protect the team in the off-chance that we lost communications with LCROSS until the last few minutes. However, without accurate knowledge of the S-S/C post-burn orbit, they wouldn’t point the cameras as accurately as the re-planned versions. That planning was up to the next shift, using the actual, measured orbit after Braking Burn. With that, Shift A was done. In a rush all day, we sat on console for a few more minutes, soaked up our last experiences as members of the LCROSS Flight Team. It was a bittersweet moment – so many experiences in those chairs in such a short time, and the culmination of three years of preparation. Our final shift had gone perfectly – the result of months of thought and practice, and a great spacecraft design. The moment we’d all been waiting for was only 8 hours away, and then the LCROSS flight would be over. Officially, our time was over now. Shift B folks began milling into the control room, with a combination of big smiles and game faces on, ready to get started on their last shift. With just a little reluctance, we stood up from our chairs, and got on with shift handover. Figure 3: MOCR Shift A: The Ames-local part of Shift A that ran Separation through Braking Burn. Pictured from R to L: Matt D’Ortenzio (Flight Controller, NASA Ames), Matt Reed (Attitude Control Engineer, Northrop Grumman), Tony Lindsey (Data Management Engineer, NASA Ames), Tony Colaprete (LCROSS Principal Investigator, NASA Ames), Darin Foreman (Systems Engineer, NASA Ames), and myself, Paul Tompkins (Flight Director, Stinger Ghaffarian Technologies at NASA Ames). A lot of other people also worked this shift and contributed to its success! Remember, the next post will feature Mark Shirley, our Payload Engineer. Stay tuned, and thanks for reading! The velocity induced by Separation between the S-S/C and Centaur (0.7 m/s) would be too little to achieve that distance in only 9 hours 40 minutes, so the Braking Burn was inserted into the mission design to slow down the S-S/C down by an additional 9.0 m/s (about 16 times the velocity change of Separation). I think nearly 13 times the velocity change of Separation. But thank’s for so mutch information. My wife and I watched the live coverage of the impacts with 100 people in Boulder Colorado. It was very exciting. Congratulations on all your hard work. A friend of mine told me about this site, and this is my first visit here. Honestly I don’t like physical science and most of my GPA grade was C on the field of physical science, but I do love every time NASA announce a new project result. I also love the pictures of planets and other astronomy related pictures just like the shown above. Well I hope this world will get better and better with NASA’s new technology. Next Next post: What Happened on Impact Night?